The scene continues as the vampire reveals his fangs, but the girl is not afraid. She agrees to go home with him. “So, your place. Is there gonna be velvet?” she asks. “Yeah, sure,” he replies, a tinge of dismissive disgust in his voice. “This is it? It smells like pee,” she says … just before being eaten by another vampire. No wonder people claim that romance is dead. Dean and Sam are investigating a series of disappearances, 6 girls in 7 days. The case brings them near to Lisa and Ben, so Dean is looking forward to taking a little time to visit his pseudo-family. As Sam accesses her computer, he finds a series of e-mails indicating that someone online was claiming to be a vampire, no doubt in an attempt to seduce her. The question that remains is whether this is a garden-variety pervert, or are actual vampires using this as a way to garner victims? Scene cut – it appears a bunch of vampires are robbing the local bloodmobile. Weird. I mean, not weird on its own merits, but weird given that the plot seems to be vampires feeding on teenage girls. Sam, it seems, has similar questions. He and Dean go to the bar where the Kristen met Robert (they get the name from her e-mail). They split up, having seen two suspicious vampiric-looking pick-ups. Sam’s ends with a no-nonsense decapitation of the vamp. Dean finds a guy with fake vampire fangs and, possibly, glitter, to help him pick up the chicks. Then he’s accosted by a vampire, who feeds him vampire blood. The problem is that Sam comes into the alley while Dean’s being attacked by the vampire and … just watches. He seems kind of mesmerized. Possibly intrigued. When the vampire is actually feeding dean, there’s a slight quirk of the lips. I have no idea how to interpret any of this, other than to say that I am not a fan of Sam this season. Dean sneaks out of the restroom to visit Lisa. He tells her that, no matter what happens, she and Ben meant a lot to him. Emotional communication doesn’t come naturally to him. “Thanks, for everything,” he says. The rhythm of her blood is overpowering him. “Oh, God, I’m Pattinson,” he mumbles. He runs out of the room, barely in time to stop drinking from her, but runs into Ben in the hallway. He throws Ben across the hallway and flees the house. When he gets back to Sam’s hotel room, he finds Samuel already there. Fortunately, Samuel has an old family recipe for curing a vampire … as long as Dean doesn’t feed. But they do need the blood of the vampire that turned him, so Dean has to go, by himself, into the vampire’s lair to get him. After Dean leaves, though, Samuel confronts Sam. He’d been told about the cure months ago. Sam denies this, saying it must have been Christian or somebody. Samuel nods. “That’s strange, because if you had known it’d be almost like you let him get turned. Get a man on the inside. Help us find that alpha vamp that we’ve been looking for.” Sam is indignant. 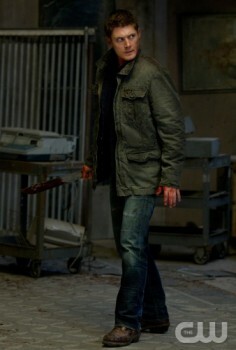 Dean, meanwhile, gets into the lair without any trouble. They’re keeping the girls alive, then planning to use them to bring in more “recruiters,” like Robert and Dean. This isn’t the plan of the vamp who turned Dean, though … it’s “their father’s” plan. With this information, Dean goes to inject the vampire with dead man’s blood … but a drop falls to the floor instead, alerting the vampire to the attack. They fight, but the fight ends when a mumbling voice from the sky causes the vampire, and then the other vampires, and then Dean, to collapse unconscious to the ground. Dean experiences a series of The Shining-like weird hallucinations of a pair of vampire girls who look like they shop at the Alice in Wonderland thrift shop. Upon awaking from this bizarre experience, Dean fights his way out with a machete. He takes out every vampire in the place, including the vampire that changed him. The cure works, giving Dean a flashback of everything that he experienced as a vampire … including, apparently, the realization that Sam let him get turned. Once back to normal, he explains to Sam and Samuel that the alpha vampire is holding a recruiting drive. And, most importantly, the vampires aren’t scared of hunters anymore. While I’m enjoying this season, they really need to get Sam straightened out, because this aspect of the plot is getting very old. Part of the problem (as well laid out in this post at Smart Pop Books) is that Supernatural is really having to restart after a strong finale, and having Sam working against Dean is a plot trope that has become way overused in past seasons. Instead of going someplace new, they’re dipping back into the same tired well by having the brothers at odds with each other in this way. In fairness, when you have only two main characters, it’s naturally to want some sort of conflict between them … but the show really does work best when the brothers aren’t constantly at odds. The good news is that the promo for the next episode implies that this particular conflict will come to head soon. Hopefully it will be resolved with Sam actually regaining some degree of emotional credibility among viewers and fans, otherwise this show has little hope of surviving the indignity of being placed in a Friday time slot.